Quilting has been around since the beginning of time. Today we will give you a great idea to make a paper quilt design, starting from a square of wrapping paper. Fold the desired square or block several times as shown in figure 1. Straight edges are always easier to cut and sew. Color sections of the folded square with crayon to create a design, as seen in figure 2. Keep this for a guide. Then make an exact copy of your designed block. 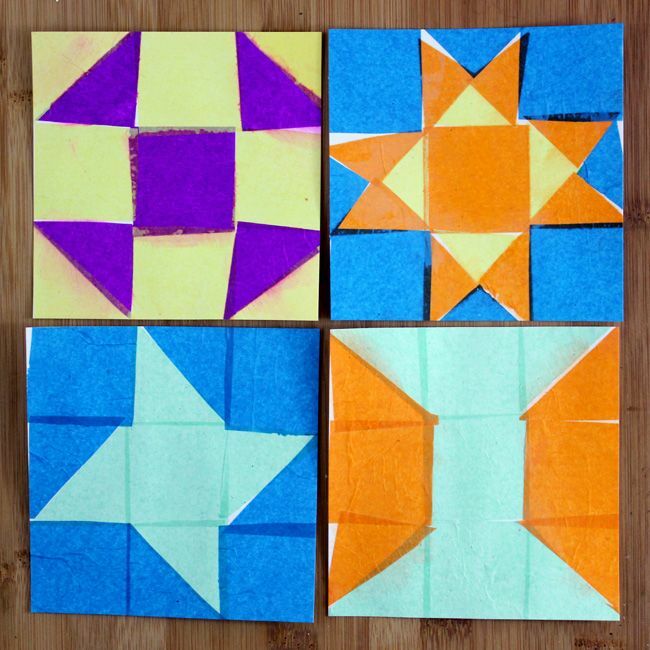 Use sections as patterns from which to cut the various pieces of felt or decorative paper needed to make your quilt block. Now get a large piece of poster board and glue the decorative pieces of paper or felt to the poster board. When it is done, your decorative paper quilt will be amazing to look at. You can create beautiful art using quilt block designs and recycled and decorative papers! Cards, wall art, etc! A quilt is a multi-layered textile, traditionally composed of three layers of fiber: a woven cloth top, a layer of batting or wadding, and a woven back, combined using the technique of quilting, stitches which hold the three layers together. Historically quilts were frequently used as bedcovers, but quilts also frequently are non-utilitarian works of art. Block design – where the top is “pieced” from a patchwork of smaller fabric pieces, the pattern and color of the pieces will be important. Nine Patch blocks are often the first blocks a child is taught to make. The block consists of three rows of three squares. A checkerboard effect with alternating dark and light squares is most commonly used. November 13, 2015 January 4, 2016 ..